Produced Dec. 1957 to Sept. 1959. Serial Number range 151xxx - 214xxx. AOCo Product No.329. Honeywell Pentax Cat.No.722. Updated April 2019. This is the first accessory lens made for the original Asahi Pentax camera. It was released on the domestic market in December 1957. A tiny elegant lens of black nickel with one aperture ring; it is best suited to use outdoors. Today it is a sentimental choice. It was produced in 15 batches for export, each of approximately 50-1200 units with serial numbers in the range 151XXX - 214XXX (including the earliest prototypes). Two names found on the front bezel are, either Takumar 1:4 35mm (batches 1-3), or Takumar 1:4 f=35mm (batches 4-15). An early pre-production copy (SN 151250?) is illustrated in the Asahi Pentax K manual (J). It has a distance scale in meters and two opposing raised finger grips on the front rim of the manual aperture ring. Such grips were a contemporary feature used by other makers. Distance scales on later export versions use both feet and meters and the front grips are absent. It is the first wide-angle lens made for Japanese SLR cameras by Asahi Optical Company (AOCo) and the lightest (135g), of the three earliest wide-angle lenses. AOCo used the recently patented “retro-focus design” which also improved focus at the corners of images it produces. Production started 12 months after the Asahi Pentax camera was launched and it was marketed overseas from May 1958. Thus the lens is listed in operating manuals (En, J) of successive camera models (S, K, S2/H2, S1/S3, H1/H3). It was superseded by two faster, semi-automatic, 35mm “Auto”-Takumars in September 1958 and September 1959, respectively, and disappeared from Asahi Pentax literature. This lens and the Fisheye Takumar f11/18mm are the only manual Takumars with focal lengths < 300mm. 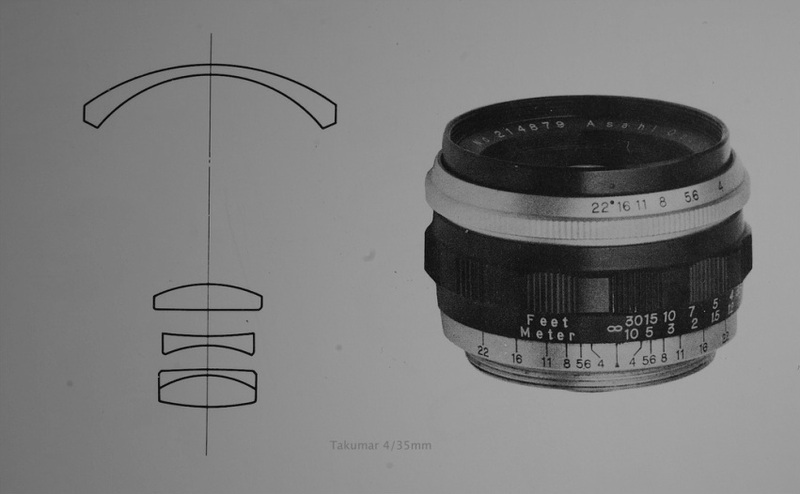 The optical design is retro-focus tessā-gata (Tessar type) with 5 elements in 4 groups as illustrated in the repair manual (Asahi Pentax 1967). The tiny aperture has ten sickle-shaped blades. All short focal length Takumars and Auto-Takumars are equipped with apertures composed of at least 10 blades. Five, six or eight-bladed apertures were used from Super-Takumars onwards. The barrel, front bezel and focussing ring are black metal with white engraving, except for two silver rings with black engraving. Its muted black/white lettering belies its Asahi-Kogaku Takumar heritage (multi-coloured lettering was adopted in 1960). Exported copies have six digit serial numbers in the range 156XXX - 214XXX after the prefix (“No”). This prefix (i.e. lacking a stop) is used on this lens only. Serial numbers of all Asahiflex and Asahi Pentax cameras and all their other lenses bear either "No","No. ", or, (for Takumars from the early 1960's) no prefixes. The last cameras carrying a SN prefix were early copies of Asahi Pentax S1a, before the transition from six to seven numerals occurred. The aperture adjusting ring is finely-knurled with 6 available aperture stops, marked (f=4-22), opposite a red dot on the barrel and has no half-stops. (The front edge of this ring on the earliest domestic version has protruding finger grips). The focussing ring is inscribed with a small infinity symbol and dual distance scales, Feet (30ft-1.5ft) above and Meter (10m-0.45m) below, a convention adopted for all successive Takumars made to export. The copy illustrated in the (J) operating manual for the Asahi Pentax K carries only a meter scale. The earliest batches of preceding Takumars made for Japanese (m) or foreign markets (ft) carry single distance scales. Exported copies of this lens carry both. The focussing ring bears twelve concave finger grips each with 10 grooves. This is standard for all normal preset Takumars of the time, but not for larger or later models. Illustrations of the lens hood elsewhere are few (eg. hood ). The slip-on hood illustrated is similar to that for the later Auto-Takumar 1: 3.5/35mm but with different inscriptions. The former has inscribed on the silver ring a red dot for aperture use when mounted (not needed for the Auto-Takumar) and the maker's name. The latter carries the names of both lens and maker inscribed in white on the black section. A range of alternative contemporary caps and cases to suit this lens are illustrated under accessories in the Field Guide. The makers' name on the front bezel of lenses with the early name (batches 1-3) is written as "Asahi OPt Co.", and, as "Asahi Opt. Co," on those with the later name (batches 4-14). The makers' name as it appears on the accessory hood for the lens "ASAHI OPT Co." is most similar to that on early named lenses. These minor conventions were in flux during the production of this lens. "Asahi Opt. Co.," is subsequently used on most AOCo products including both of the 35mm Auto-Takumars which replaced this short lived manual lens. Some lenses in the last 3 batches have a small black dot on the aperture ring at the final (f=22) position (see opposite) to mark the limit of movement. The numeral 22 lies beyond this limit because the amount of movement between the last two stops is minimal. This is the only use of a black dot for that purpose, but it inspired the evolution of later Takumars, because black dots and, later, blue or white dots, would substitute for numerals on aperture rings in the future to indicate available half-stops and full stops. The military mark "E-P" framed in a diamond shape may be stamped into the base opposite the low end of the distance scale. Van Oosten (1999) illustrates this marking on one of his own lenses and I have several (see Collection). Peter Kitchingman (2008), who discusses these markings on Canon lenses of the same era, claims that lenses so marked were sold on cameras and as accessories through US Army PX stores to military personnel in Japan and Korea from 1953-1974. The centrally inclined f=4 bars on the depth of field gauge are unique. These bars are straight (axial) or inclined away from the centre bar on all other Takumars, except this lens and its immediate successor the Auto-Takumar 2.3/35mm that also has centrally inclined bars (for f=2.8). LENS PRODUCTION (∑ lenses) ∑n = 105 Serial Numbers (SN) observed in 15 Batches covering 3,391 SN min.< ∑ lenses < 5,173 SN max. Styles: ▼ SN prefix "No" ▲/▼▼ Takumar 1:4 35mm ▲▲;▼▼▼ Takumar 1:4 f=35mm ▲▲▲. Sherfy (1994) states "unpublished information indicates that approximately 4,200 units of this lens may have been produced." The early domestic version is illustrated in the Asahi Pentax K manual (J). Rather than describe it as a "manual lens" in a competitive sales environment Asahi Pentax brochures (En) emphasised the lack of a pre-set diaphragm ring. Operating manuals for Pentax S, K, S2, H2, Heiland Pentax H1/H3 and Honeywell Pentax H1/H3 cameras for export (En) all contain the following description. “Same size as standard lens: can be put into the camera case together with the PENTAX. Light in weight: easy to use. You do not usually need an aperture brighter than f4 for general daylight outdoor picture taking. Published information is sparse, sometimes unsourced or misleading. Recent guide books (Sherfy, 1994 ; van Ootsen, 1999) and websites offer opinions or information on using or servicing this lens. Production was discontinued in September 1959 before its existence was noted in general literature. Murphy (1960) compared it with its 35mm Auto-Takumar successors. "35mm TAKUMAR, f/4: Though it does not have the automatic feature of the f/2.3 this lens is a good general category optic. Unless you anticipate frequent dim-light shooting situations without flash or other supplemental lighting, this lens is for you. Consisting of 5 elements, it is equipped with click-stops down to f/22. Minimum focusing distance, as with the f/2.3, is 1.5 feet; 63° angle of view. In a leather case, $64.50." Retail prices quoted by Murphy (1960) show it was the least costly of the three available 35mm lenses. The most expensive (in the U.S.A. market) being the Auto-Takumar f/2.3 priced at $124.50 in a leather case. Sherfy (1994) added that it was sold by mail order in the U.S.A. market for between $47.00 and $33.00 and heavily discounted in 1960 for as little as $27.00. Murphy (1960) compared the Takumar f/4 to the just released Auto-Takumar f/3.5. In a confusing post-publication endnote he implies the latter lacked a cocking lever and referred to it as the f/3.5 Takumar (corrections in brackets below). Though aware of the new lens, he had yet to see it? "35mm [AUTO-] TAKUMAR, f/3.5: For those who want a faster lens than the f/4, but don’t need the automatic feature and extreme lens speed of the f/2.3, the f/3.5 [Auto-] Takumar, just introduced, yields excellent results. It is designed with 5 elements, stops down to f/22, and will focus down to 1.5 feet. In a leather case, $84.50." Emanuel (1960) explains how the manual aperture control of this lens operates differently from those with preset and automatic aperture controls and that the lens can be fitted with screw on 46 mm filters. Tydings (1961) also provided the Heiland catalogue number 783 for the lens hood and Tydings (1961, 1966) states 46mm Pentax filters are available for the Takumar 35mm/f4. Cooper (1964) provides the Honeywell Pentax catalogue numbers of its accessories (p 34) but makes no other comment on the lens. Cat No 783 Lens hood for 35mm f/3.5 (Auto-Takumar) and 35mm f/4 lenses." The lens tables in Emanuel (1964) published in June that year and all subsequent editions to 1981 show the lens as discontinued. Honeywell Photographic Products (1965) also announced that the lens was discontinued in January 1964. There is no mention of the lens in later publications (eg. Keppler 1967, Cooper 1970).